Epilepsy, a seizure disorder, can be devastating to individuals and families. Here are three exceptional resources on this neurological condition. Mommy, I Feel Funny! 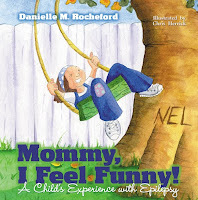 A Child's Experience With Epilepsy a book by Danielle M. Rocheford and Chris Herrick takes the reader into the world of Nel. "Based on a true story, Mommy, I Feel Funny! introduces the reader to Nel, a little girl who is diagnosed with epilepsy. The story takes you through the days following Nel's first seizure. Suddenly, Nel and her family are faced with thoughts, fears and emotions that come with the discovery, understanding and acceptance of epilepsy." On October 25, 2009 the weekly television news magazine, "60 Minutes," aired "Fight For a Cure," a story about Lauren Axelrod, the daughter of President Obama's Senior Advisor, David Axelrod. The oldest daughter of David and Susan was diagnosed with epilepsy 28 years ago as an infant. Susan is the President of CURE (Citizens United for Research in Epilepsy).